The old hymn that my family loves to sing acapella was written with deeply moving lyrics and melodies. This past Saturday, we enjoyed celebrating 75 years with Mom. She’s a firecracker! Still flits around like she’s in her twenties, loves to sing and play music, always busy about her cooking or housekeeping, and ever concerned with the well-being of others. She is one of the brightest souls I’ve ever known. She loves well, and is so loved by many. When we get together, there is always a sing-along moment involved. So, as usual, we enjoyed greetings, mixing-and-mingling, southern fried cuisine (( yum!! )) … and, of course, good old Gospel singing. One of the kids captured our impromptu vocal rendition of the hymn on Facebook live, posted it, and within hours we were getting ‘Likes’ from dear friends and family from all over the nation who love and encourage our musical heritage. One family friend notified of us the sobering reality that their newborn baby boy is suffering a seizure-related condition and asked for prayer. We immediately called upon the Father on their behalf and ‘shared’ their request with our connected Friends. Others noted how this song and our family harmonies are inspiring and uplifting, which brings us great joy. This morning, our church staff begins a #21DaysOfPrayer campaign for the kick-off of Back-To-School season in our hometowns, and as a reminder that we are embarking upon the final ‘season’ of this calendar year. The intent is to refocus, lift up prayers to the Father for this season, and ask His will be done in our lives, our families, our church, our nation, our world. At our home church, that format includes a congregational worship song, a scripture reading from our pastor, an extended time of personal and corporate prayers and songs, with a closing prayer from our pastor. During my quiet time, several scriptures from Chronicles and Psalms were brought to my attention describing King David’s instruction for ‘divisions’ or ‘sections’ as skilled musicians and worshipers were trained and contracted for worship at the Temple. As I pondered my life as a musician and worshiper of God, the Holy Spirit seemed to nudge me to remember that God has called me from my Mother’s womb to be His child — a worshiper. A musician. A singer of songs. A producer of things that are musical and artistic in form. Mom has reminded her boys all our lives, that she “gave us back to God” when we were born. One of the very first Gospel songs I recall Mom singing and teaching us was titled Born To Serve The Lord, a Southern Gospel favorite in the 1970s and 80s. Wow. Born … to serve the LORD. The One. The God of the universe. The Holy Father. The Foundation upon whom all creation rests. That’s a heavy thought for a Monday morning. The weight of the responsibility of serving a LORD that great and expansive was nearly overwhelming in my spirit as I quietly sang and prayed. My soul was stirred and the tears flowed as I considered the thousands and thousands of miles that I’ve traveled during my brief 54 years here. Nearly all of those journeys have included Song. God knew that I would be a musician and singer. He knew that my soul would need the healing touch of songs, of poetry, of lyrics, of art. He created me just as I am of course, and I am so grateful that He inspires me through music. 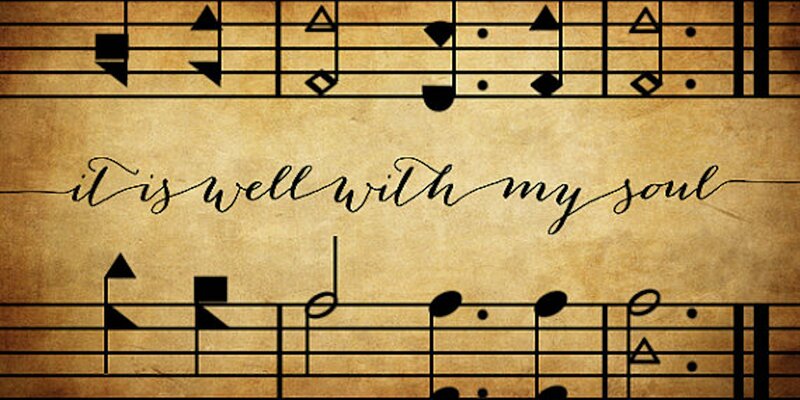 So, as I meditate on the songs that have touched my life, this beloved hymn — It Is Well — seems to come forward most often. The maybe list is endless. Maybe … it’s the gentle voice of the Father. Reminding me once again … it is well. Thank you Father. All is well.